The origins of Duet for One lay in a private puzzle that I set for my father’s 80th birthday in 2008, where solvers were required to darken the cells with letters not present in his full name, such that the figure 80 appeared in the completed diagram. This led me to wonder whether it was possible to construct a diagram where darkening certain cells would lead to a traditional blocked diagram, which could then be solved as well. Since there would be fewer clues in the blocked diagram, maybe it was possible to contain all the necessary instructions and the secondary clues by means of a single word added to each primary clue. At the same time, it struck me that it would be good to hide a message in the second diagram that somehow related back to the original diagram, leaving only one diagram to be submitted but in a way that showed that the second diagram had been substantially solved correctly. Hence the advent of the “Buy one get one free” idea, leaving BOGOF to be highlighted in the primary grid. The two halves of the alphabet were the obvious way to separate light and dark cells (particularly with “atom” being a convenient extra word to cover this concept), and this led naturally to trying BOGOF in at the top of the leading diagonal, giving a normal blocked grid pattern in the NW corner. In retrospect, this was probably a mistake and I wish I had put a red herring into those five squares to catch out the unwary – or more particularly those who would just assume these were the five letters to be highlighted…. The reason that I did not subsequently change this was that the diagram turned out to be quite tricky to fill. In fact more than once I despaired of ever filling it. But with patience it gradually fell into place, and for once, the number of short words was less of an issue, because I needed more clues to fit in all the instructions and the secondary clues. The clueing itself was not so difficult, although having to fit specific words into the clues led to less flexibility in clueing, with the result that many clues were constrained by the material to be included. Titling is usually the last thing that I do, and my Listener puzzles have usually had musical titles. That led to the thought of Duo or Duet and hence to the title actually used. An initial version of the completed puzzle went to the Listener vetters. This is an appropriate time to pay tribute to their guardianship of the quality of the Listener crossword – and their own powers of crossword compiling. 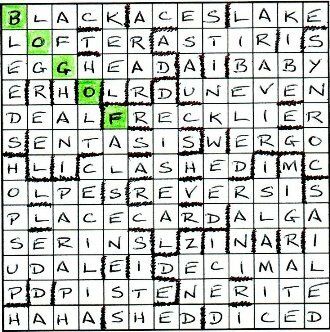 As well as a number of suggestions to improve clues, they suggested an important improvement to the grid (removing a marginally offensive word) and – most importantly – suggested that the whole thing would be neater if the break between the secondary across clues and down clues coincided with that between the primary across and down clues (which was not the case with the puzzle as originally submitted). So it was back to the drawing board to re-draft the instructions and then re-write the clues. This was a somewhat surreal experience since the diagram words and “extra” words were largely the same but re-shuffled to give different combinations than those originally clued. Some weeks later, I submitted the revised puzzle and this time it was approved for publication. My thanks are also due to John Green for his peerless effort and attention to detail in marking the entries and collating comments etc for the setter; to the editors, as above; and particularly to the solving fraternity for all the kind comments – and specifically to LWO for publishing these comments. An enthusiastic Numpty vote of confidence for Bandmaster’s Duet for One – how could it be anything else? Didn’t we get two for the price of one and, even better, one that was just about at Numpty solving level. 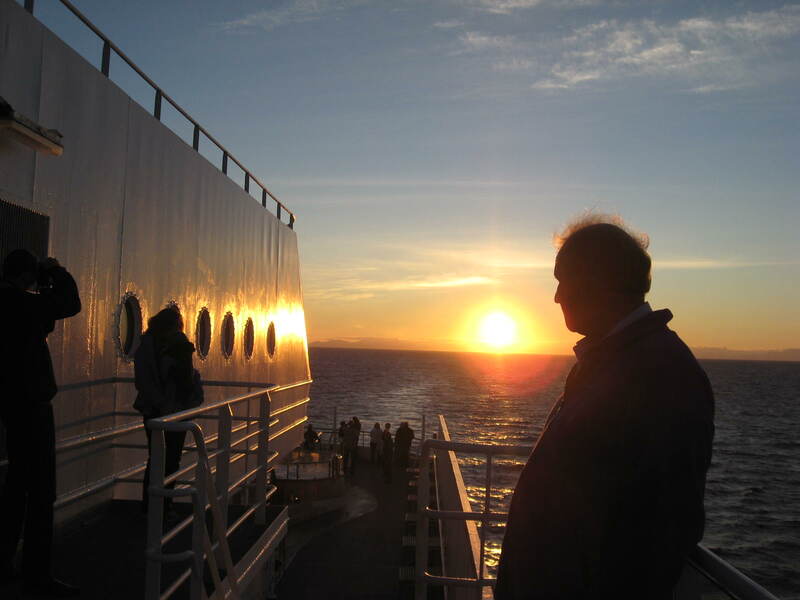 We were a long way from home (still are) north of the Arctic Circle with24 hours a day of dazzling and scorching sunlight, feeling sorry for all our rain-bound friends, but fortunately the little laptop has Antony Lewis’s Crossword Compiler loaded on it. I wonder how solvers with only a pencil and an eraser cope with a carte blanche barred crossword that magically converts itself to a sort of Numpty-level blocked grid (of the ‘stripey horse (5)’ ilk – just my thing) then requires us to submit the one we laboriously solved in the first place. No, I am not complaining: I thought this was a work of genius. Of course Bandmaster earned his place in the alcohol quaffing Listener compilers’ club with his lovely clue ‘[Deceiving] jug getting people endlessly tipsy (4)’ (PEOPLE losing both ends and going rather squiffy = OLPE). Incidentally, is that yet more evidence that ‘endlessly’ can happily suggest the loss of both ends as well as just the end end? I like it! It wasn’t a weakness of ‘Duet for One’ that we had sussed out what we were going to do before we had solved anything much at all: REFORM DIAGRAM CLEARING CELLS CONTAINING A TO M SIMULTANEOUSLY DARKENING REMAINDER. RE-SOLVE USING THESE DEFINITIONS. (Well, it didn’t take us long to see that there was no moggy lurking in there and not much hope of bosons or quarks so it couldn’t be A TOM or ATOM) FIND SLANTWISE EXPRESSION. SUBMIT ORIGINAL BARRED NUMBERLESS GRID HIGHLIGHTING FIVE ALIGNED LETTERS. Solving was fun, even with only a Franklin Chambers and the ccw application and when we managed to resist midnight sun viewing we soon had an almost complete grid. ‘Wise hospital operations increase drugs (6, two words)’ defeated us (and perhaps other solvers too?) but fortunately the intersecting letters and that very transparent clue taught us that HOPS UP is a term for drugs. We had been enjoying this from the start but my admiration knew no bounds when a symmetrical blocked grid appeared as we darkened N to Z. My new little Franklin Chambers gadget (Model CWR-119) was positively burning with pride as it had its first outing, producing words like FEDAYEE and ENDUE to fit those definitions. No, honestly Bandmaster, this time it was a genuine bargain – pure magic, though my Franklin toy didn’t like BOGOF. It suggested I BACK OFF. Still, I took a chance and highlighted BOGOF (that rather rude-sounding word) and carefully checked my original barred grid. Thank you Bandmaster, thank you Bandmaster (twice). This was all a crossword should be AND MORE. Remember the opening of my blog for last week’s puzzle by Hedge-sparrow: “It was Saturday morning and rubbish weather to boot, so time to get on with the Listener. The trouble was that this was the puzzle from the previous week, and I was running horribly late with everything. This was probably due to the stress of moving house, on which I’m scheduled to exchange contracts towards the end of the month and complete in early August. Watch this space.” Replace ‘Saturday’ with ‘Sunday’ and that’s this week’s opening! And it was a carte blanche to boot. And a Bandmaster, who I think is one of the trickier practitioners. I can’t find a puzzle of his that I’ve blogged, and pre-2011 puzzles have all been packaged up ready for the house-move. So it was onwards and upwards with a blank grid in front of me. Every clue had an extra word which had to be removed before solving. I did a double-take to confirm that it said “extra word” not “letter”. I thought that would make life pretty easy, after all they must be fairly obvious. I was half right. In the first six clues were the words reform diagram clearing cells containing atom, and the atom seemed likely to become A to M. After that, the extra words seemed a little less reluctant to stand out, until the end of the down clues, where I found submit original barred numberless grid highlighting five aligned letters. Not that all this pre-solving guesswork helped me hugely with the clues, and that was borne out by the very slow progress that I made after highlighting the central point of the across clues … Chambers’ first discarded slack editor — definitions were consistent. Since the clues lacked entry lengths, it was essential to add them with every clue that was solved, making sure to similarly mark the symmetrically opposite clue if it was one of the acrosses. ASTIR, UNEVEN, ERGO, then BLEEDS. That was all I solved in the first fifteen minutes, and I had been right about Bandmaster’s trickiness. After about an hour, I was beginning to get answers slotted into their correct places in the grid. And after about four hours, I’d finished it. This was a tough puzzle. I’m afraid I didn’t have much time to spend on blog notes this week, partly because of all this house move stuff, partly because I’m back at work part-time, and partly because the animation on the right took ever so slightly longer than normal to produce. OK, OK, other things took up my time as well, including golf and the pub, both of which I indulged in to relieve stress! So the reason why the extra words weren’t quite as easy to tease out as those in the first and last clues was that they were basically just random definitions. These were the definitions to the words in a conventional 13×13 block diagram puzzle, with the grid generated by removing all the letters A to M and blacking in the others. Luckily, the definitions were in the normal order, and it only took about 15 minutes to complete. I had, at first, wondered whether some of the entries were clued by more than one word since there seemed to be a few extra ‘extra words’. However, there was another bit of important instruction to be found: find slantwise expression. I actually got the diagonal hint fairly early on as BUY appeared running NW-SE, and once finished, there was BUY ONE, GET ONE FREE. Back to the original grid, and in the top left corner, also running NW-SE, was BOGOF. The puzzle was complete, and great fun it was, thanks Bandmaster. 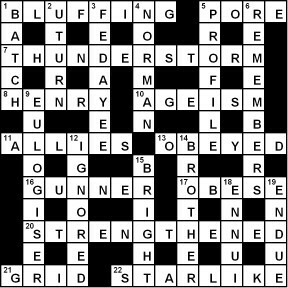 Having constructed a few Listener crosswords with scientific themes, I thought I’d like to try an alternative tack for a change. 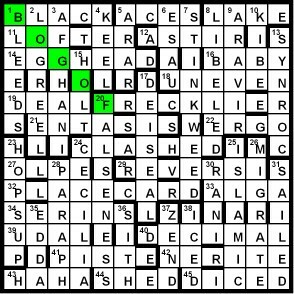 I found myself wondering one day how easy (or otherwise) it would be to construct a grid in which half the answers had a letter removed before entry, and the other half had that same set of letters inserted, always producing real words and with the usual rules for grid construction, symmetry, etc. “Here and There” was the result. In fact, the construction of the grid was not as difficult as might be expected: perhaps I was just fortunate that it all came together reasonably quickly. As always, the process of making up the clues took much longer. I also had to think carefully about what information solvers would actually need to have in order to reach a solution: for example, should I clue the words forming the unmodified answers, or the modified grid entries, or both? At first, I was minded to clue the unmodified answers and then have one-word definitions of the actual grid entries randomly distributed throughout the clues as “redundant” words. I can’t remember why I decided to move away from this idea, but I ended up clueing just the unmodified answers, and leaving solvers to deduce the fact that each entry required one letter either to be added or removed. The necessary information that “All entries are real terms” was included as “letter insertion” or “letter deletion” misprints in the down clues (rather than just being stated in the preamble) in order to provide an additional hint of the required grid entry technique. One consequence of this was that not one of the actual grid entries was clued. I was concerned that this might not be considered “fair” by solvers, but the editors seemed to be happy with it. I also had to make sure that the solution was unique: most of the amendments to grid entries are “forced” by crossing entries, but there are a couple (20 dn and 32 dn) which are ambiguous. Eventually I convinced myself that the fact that the sets of extracted and inserted letters are the same “forces” the amendments at these entries, and that the solution is indeed unique. The infamous “special” clue was really a bit of an afterthought. Having constructed the grid and started on the clueing, I began to wonder if it wasn’t just a bit too “mechanical” and dull. The special clue with its possibility of two answers, either of which (after amendment) could form the entry at 28 ac, was really intended to provide a bit of additional interest to the solving process, but it also became the means by which the equivalence of the sets of extracted and inserted letters is established (see below), again rather than simply stating this fact in the preamble. I think most solvers will have deduced early on that all entries are either one letter shorter or one letter longer than the clue answer. The preamble didn’t explicitly state that there are equal numbers of both types, but this could obviously be deduced by solving all the clues and checking answer length against grid entry space: also, as noted above, it is hinted at in the down clues which are also of “letter extracted” or “letter added” type, and in equal numbers. But the key to the crucial fact that the sets of extracted and inserted letters are the same is the “special clue” 28 ac: “Mental disorder: Hebrew woman rings NICE doctors for a pill”. What I intended should happen, once solvers had identified this as the special clue, was: (i) solvers would identify the two separate definitions for possible entries at 28 ac: “Mental disorder” = MANIA, and “Hebrew woman” = MARIA, giving possible entries MANA or MARA once the letter “I” is removed (the preamble does state that all answers require amendment before entry in the grid, including this entry for the special clue); (ii) notice that the remaining phrase in the clue for 28 ac (“rings NICE doctors for a pill”) comprises a total of 24 letters, and since one of these is an “extra” letter not involved in grid entry amendments, there are therefore only a total of 23 letters involved in the amendments. The fact that there are only a total of 23 letters involved in amendments for the 46 entries forces the sets of “extracted” and “introduced” letters to be the same. The fact that these sets are the same, together with the information derived from the down clues that “all entries are real terms”, also “forces” the letters to be inserted at the “ambiguous” positions such as 20 dn and 32 dn. So apologies to all those solvers whom I inadvertently confused with “Here and There”. I find that it is never very easy to judge the level of difficulty of a particular crossword, nor how much additional information to provide either in the preamble or “hidden” in the clues. The Listener Crossword editors of course provide assistance with this aspect (as always, they were extremely helpful and thorough with getting “Here and There” ready for publication), but even then the result may not please everyone. But many thanks to all those solvers who have taken the trouble to get back to me with their thoughts and comments – it’s much appreciated. It was Saturday morning and rubbish weather to boot, so time to get on with the Listener. The trouble was that this was the puzzle from the previous week, and I was running horribly late with everything. This was probably due to the stress of moving house, on which I’m scheduled to exchange contracts towards the end of the month and complete in early August. Watch this space. This was Hedge-sparrow’s fifth Listener, his last being about the Large Hadron Collider at Cern which has recently discovered the Higgs Boson. Or, at least so I thought: it might just be a boson. I can understand the doubt, since it exists for something like a thousandth of a billionth of a billionth of a second … not even time to make a nice cup of tea! Anyway, back to Here and There. Everything here was quite normal … except for the fact that every answer had to be modfied before entry, and there was one extra special clue containing two definitions and a jumble of letters involved in the modifications. 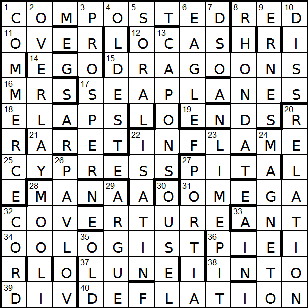 The extra or missing letters in the down clues would provide additional, and hopefully helpful, information. It started at a lick, with 1ac Collected schoolgirl clutching broken mops (9) giving me COMPOSED … only 8 letters though. Luckily my brain hadn’t been too distracted by the (9) given. This turned out to be pretty easy, and as I toyed with entering COMPOSTED in the grid, I wondered whether it had been devised to be deliberately easy. 12ac Whales moving across heaving bit of sea (4) came next, and was ORCAS (ACROSS – bit of Seas)*, one letter too long, but it could be entered as OCAS, ORCS. So, after two clues solved, it looked like I’d sussed it, and like the down clues, all entries either gained a letter or lost a letter, still preserving a real word. Moreover, in my first pass through the clues, I paused at 28ac and thought it might be the ‘special’ clue. Mental disorder: Hebrew woman rings NICE doctors for a pill (4) just seemed to have too much going on for it to be a clue to a single entry. 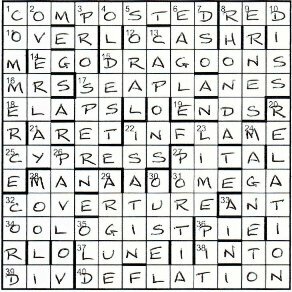 However, with a couple of definitions to account for, it didn’t have anywhere near the 46 letters that were needed to be a jumble of the extra/missing letters in all the clues. 1dn Company welcoming Madame as Lady Mac, with its Macbeth hint but turned out to have an extra letter, with Lady MC being the definition of COMMERE. This was one of a couple of clues requiring the ‘sometimes changing case’ warning in the preamble. And of course: 7dn At foot of force of Reichenbach, Sherlock’s heard Moriarty’s second cry of surprise (3), which led to ODSO, OD (Reichenbach’s force) + S (Sherlock’s head, heard losing the letter R) + O (Moriarty’s second letter). I also loved 34ac Clockmaker taking off back of watch for mountain specialist (8) which gave HOROLOGIST (watchmaker) – H (back of watcH) to give OROLOGIST, which then lost the R to give OOLOGIST as the entry. Meanwhile, the extra/missing letters (E/MLs) in the down clues spelt out All entries are real terms. Obviously this turned out to be less than helpful since I’d been aware of that for the previous couple of hours! Now, when I say that the grid was finished in 2½ hours, I was obviously bending the truth. 20dn and 32dn both had alternative entries. 20dn •ELATION could be DELATION, GELATION or RELATION, and 32dn CO•D could be any one of four alternatives. And then there was that pesky 28ac, which was certainly the special clue. While mental disorder was MANIA, it took me sometime to discover from my old Chambers that Maria (see Mary) was a Hebrew name from the New Testament form of Miriam, of uncertain meaning. And there was I thinking it was Italian! I must say that I thought Hebrew woman was too loose a definition of the name, and was particularly unfair given the clue’s crucial role in the puzzle and the lack of the Some First Names section in the latest Chambers. Sorry, but I think this could have been better. Anyway, these three ambiguities would no doubt be resolved by the jumbled letters forming the second part of the special clue. There were only two Es, four Cs and six Os. And rings NICE doctors for a pill had one E, two Cs and three Os. Of course, it had precisely 24 letters as well, half the number of clues plus one! More importantly, it had two Rs and two Ns. It still took me a bit of time to get my head round it all, but the second half of 28ac had to be used twice to give all the E/MLs in the grid. This meant that the three question marks had to comprise two Rs to make the six required by the E/MLs, and the letter left over to be used to clarify 28ac … with two Ns in the E/MLs, only one of the Ns in the clue jumble was required, leaving the final N for 28ac. Result — RELATION, CORD and MANA. I think! Phew!! That turned into quite a struggle at the end, but I think I was satisfied, and the grid construction must have been tricky to say the least. I wonder where Hedge-sparrow got the idea! Good fun.